Mike Brown has been named the winner of the Red Auerbach Trophy as the NBA Coach of the Year for the 2008-09 season, the NBA announced today. Brown received a total of 355 points, including 55 first-place votes out of a possible 122, from a panel of sportswriters and broadcasters throughout the United States and Canada. Cavaliers owner Dan Gilbert called Brown a “natural leader” and credited him with much of his team’s success. “Mike Brown is one of these rare people that has nearly every tool in his tool box,” Gilbert said in a statement. “He is smart, hard working, and selfless. He is curious and hungry to learn. He is philosophically driven and derives his decision making from his strong philosophy. 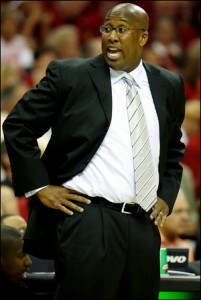 Brown earned Eastern Conference Coach of the Month honors on three different occasions this season. For the first time in franchise history, Cleveland led the NBA in points per game differential (+8.9). The Cavs defense also allowed the fewest points per game in the league (91.4), the lowest opponent three-point percentage (.333) and the second-lowest opponent field goal percentage (.431). The Cleveland defense held opponents under 100 points an NBA-high 63 times.